This is not the post I had intended for today. I caught a nasty bug, so taking photos just was not in the cards. I do, however, want to talk about scarves! This the time of year where you can either go full-on costume or add a little Halloween/fall flavor to your outfit. In the past, I have worn the likes of a spider necklace. This year, I decided I wanted to add a scarf. 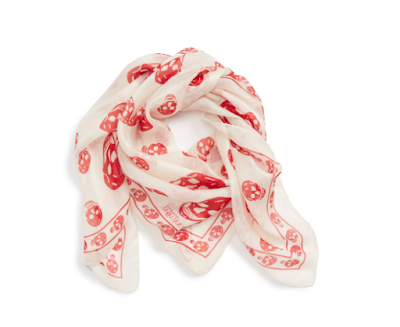 My choice was an Alexander McQueen skull scarf (similar to above). They are currently available at Nordstrom and come in a variety of silk weights and design colors. Since we are frugal here at FF, I found one on Poshmark that was much less expensive. If you are looking for something not as pricy for fun and added color, I have included some examples. In my sometimes "rebel" fashion spirit, I like to use different colors like some of the variations here vs. traditional orange. Scarves are such a great way to add a colorful or festive accent to your outfit, and are often budget-friendly, especially when you calculate cost-per-wear. So if you are considering adding a bit of fall color, Halloween, or skull looks to your wardrobe, a scarf is a versatile option. Oh friend, I am sorry you had a bug - yuck! 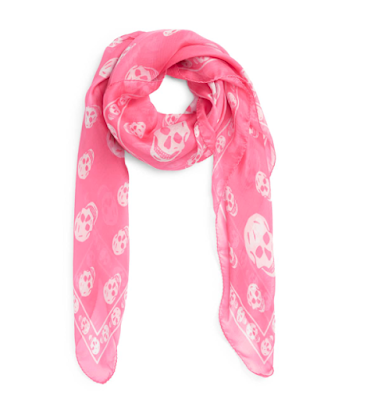 Great scarves, so cute for halloween. Feel better my love! Thank you--finally feeling better today--Saturday. Ugh! I hope you feel better today and can enjoy your weekend! Thank you, Nancy. I'm finally feeling better! Scarves are so perfect for this colder weather. I rarely go anywhere without one. Thanks, Jodie. I'm struggling today, since I wanted to take photos and, you guessed it, too hot! Whine!